Next year, we are planning to surprise the boys with their first trip to the Florida theme parks and I have no doubt that they will be over the moon with excitement… but they were also giddy with joy today because it was movie and PJ day at camp. In trying to be the best possible parents, we sometimes forget that it can be the little things that give our children the most joy. This weekend, five boys were collectively moping around our sunny backyard because they were “so bored”. (In reality it was because we wouldn’t let them inside to play Minecraft.) Suddenly, my genius spouse came up with an idea. He popped open the back of our Forrester and told them to throw in whatever toys/sports equipment they wanted and he would drive it two blocks to the schoolyard and field. The boys all hopped on their bikes and I walked over with them. For almost three hours the play was nonstop. They played soccer, hockey, and baseball. I hit tennis balls with each of them in turn and they individually hit off the school wall. They organized a Nerf gun fight using the two sets of climbing equipment as bases, and ET finally learned to ride his bike without training wheels. The outing meant that The Husband and I didn’t get those hours to be home puttering around, but we also didn’t have to shell-out any money and the boys burned off a lot of energy. It was uncomplicated and fun. Diving for things at the bottom of a pool. 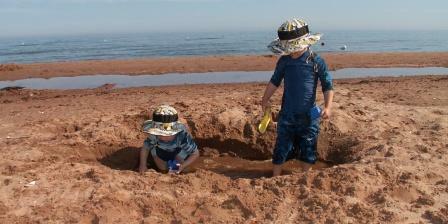 Digging a deep hole at the beach. Writing a book about farts. Which simple activities bring joy to your family? This entry was posted in Family and tagged boredom, entertaining kids, Family, humor, humour, kids, Minecraft, Nerf, Parenting, Recreation. Bookmark the permalink. They are the highest form of humour around here! We’re big on simple activities around here. My parents always gave us plenty of time to just “be” and I’m grateful for that. I think kids need time to create their own games, use their imaginations, play without direction, read a book or just daydream. Things we like to do: read books, play board/card games, go swimming, fish/catch crayfish, walk/scooter/bike, go buy food and cook what they want to eat, hang out with friends at a park. Nice post! Thanks Miriam. The boys really have their best days when they spend it playing in the snow or having water gun fights. I like your idea of having us buy food together and have them help cook. I always make groceries such a high paced chore that I do alone. I should plan a separate trip with them purely for that purpose. Thanks for the great idea! Those are great ones! I’m with you on all of these except the breakfast – only because I’m sick of cooking these days. Hope August brings lot of chances to do them all.